...and with time the Tribes got lazy. The young were neither taught to swim the waters nor to climb the trees. Their parents forgot how to build homes and how to stack walls. And the old wandered off into to world and forgot the way back. Thus the Great Capybara in the Skies got mightily angry at the Tribes and sent thunder and fire from the skies. And the earth shook and the weasels came in masses. Thus was fear droven into the hearts of the lemmings, big and small, young and old, green- and blue-haired. And whispers started - whispers about an old piece of metal, which was so brittle that when grandgrandlem Lix dropped it, it broke into twelve pieces. About an old piece of metal powerful enough to guide the Ark of Lem to the paradisal Fields of the Lush Grass, once all pieces were joined together. And so great was their fear that it was soon decided to meet at that mystical fields of arrival to try the power of the talismans again. Can you guide each of the 12 tribes through ten perilous episodes of their journey? Try it*)! *) Currently only 32 43 47 of the 120 levels are made, with some of them already released in contests. Whenever I finish another few levels, I will update the level pack here. This means however that the levels in the level pack have totally random difficulty. Properly ordering them will be done once the level pack is complete. This pack is made for NeoLemmix V10.13.16, but should be playable with slightly older versions, too. Hey. This looks like another promising NeoLemmix Project! However, I can only play the Classic Set (And heck, I can't even solve the first level! ) If you know where the other graphic sets are, could you please upload them together in the same thread? Just didn't want to mislead any more players. Thanks. If you have online features disabled, you'll need to manually get the L2+L3 style pack and put it in a "styles" subfolder. I have replaced the April Fool's version of the first post by the serious one, now linking to a .nxp with proper levels. Given the problems with the L2 styles, they are already included in the .nxp this time, so you shouldn't get errors any more. If anyone wants to have a look at the April Fool's version, it still can be downloaded here. If requires V1.43 and will not work on any newer NeoLemmix player (including the experimental releases). Moreover it does not yet contain the L2 styles, so (as namida already mentioned) it is advisable to enable the online feature. Ha, loved those clams. Even the Rickroll music that also affected NeoLemmix helped! I had a feeling you're making a new fangame based on all these levels you were releasing in the Physics Bugs section and the contests. It seems that the two Sports levels are both "Everybody's Fool" with the exact same skillset, number of lemmings and release rate. Thanks for the info. This toolkit-bug is really annoying! If you download the .nxp again, there should be only one sports level now. Oh cool. I wasn't expecting there to be a real version and thought it was made only for the April Fools joke. Attached are my solutions for the 0.1 version. Great levels here and nice to see the tilesets in action! Another thing about the left/right sides as I thought a bit about the topic: Even if they become deadly, I think using the deadly sides actively in a lot of levels just to maintain a snaller level size is not a very good design choice. This would also apply for NepsterLems and even the packs which take advantage of the solid ones. I also don't rely on the solid sides aswell and if I need them, I use a steel wall nowdays to make it clear for the player. Maybe I'll make a general post in the level design board about this over the days as using the sides in general feels a bit dirty to me. I prefer the deadly sides by now, but even with the change it is a very inconsistant concept across all Lemming games. So why rely on them at all and confuse players. Make a water pool at the sides or put some decoration there, but just to force a smaller level size seems not the right use for them. My design proposal would be: Don't rely on the left/right side behavior at all. Is the first (only?) level of the April version solvable? Required old game version, okay. The first level of the April version is solvable (and will likely stay this way in newer NeoLemmix versions). However the level is completely unfair and disregards almost every design guideline. Replay of a solution is attached. IchoTolot found quite a lot of backroutes to the serious version. I will give a more detailed feedback including backroute-fixes later. Here the feedback for IchoTolot's solutions/backroutes. [...] I prefer the deadly sides by now, but even with the change it is a very inconsistant concept across all Lemming games. So why rely on them at all and confuse players. Make a water pool at the sides or put some decoration there, but just to force a smaller level size seems not the right use for them. Actually, with the exception of Slowfreeze I wasn't aware of the backroutes using the solid sides. This is of course partially my own fault, because I didn't explicitely check for such backroutes. In the next version, this will (hopefully) be fixed. Tailor-made for Triathletes: This is an extremely embarassing backroute. I expected one fall distance to be deadly, when it isn't. Revival of the lost: Correct basic approach, but you missed one central trick. Let's misbehave: Very interesting solution, that has absolutely nothing to do with the intended one. I am thinking about using your solution as a first part and having the intended solution as a repeat level. Lix is watching YOU! : Again an embarassing backroute, that I should have seen. Smeagol's Dream: You missed the main trick here. Stackoverflow: Essentially the intended solution. Cave of Sorrows: Nice solution, but once again missing the main trick. La Forza del Destino: Very interesting alternative solution. Just a shadow of Doubt: See comment about (non-)solid sides. Mice in the Cargo System I: Clever solution, which can perhaps be used for "Mice III", but I will remove it to enforce the trick I intend to be used. Mice in the Cargo System II: Slight variation of the intended solution. Assault on the Helicopter: More or less intended, though cleaner solutions exist. Lemmings gone wild! Isn't this my own replay, that I uploaded during the contest? Madness in the Method II: See comment about (non-)solid sides. But even without solid sides, it showed me a way to beackroute the level. So some bigger changes are needed here. Crowd control on the fence: This is another one of the more embarassing backroutes. More Melodies of Hope: Backroute, because it is way too similar to the first part. Everybody's Fool: This needs fixing too. 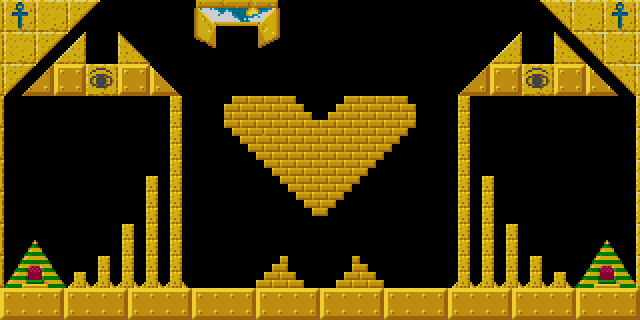 A heart for Lemmings: Completely backrouted. Serpentine Way: See comment about (non-)solid sides. All Ice in Wonderland: You simplified the intended solution too much. Slowfreeze: This needs non-solid sides and for this level, I will rely on this, because anything else does not look good and would require very sophisticated fixes. All the Nines: Open-ended level, so your solution is absolutely acceptable. Manor of the Big Paw: Slight variation of the intended solution. Choir of the Mad: See comment about (non-)solid sides. Here are some replays of the levels I was able to beat! Nice to see some new levels using the Tribes styles! 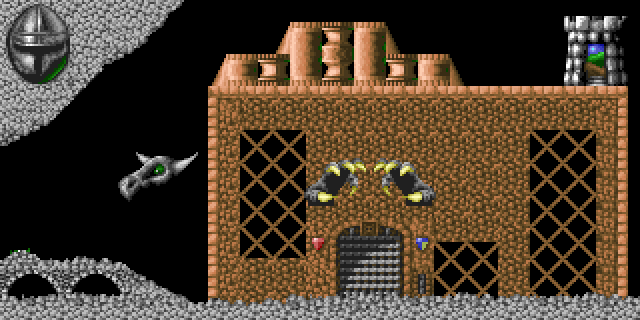 I've also noticed that All Ice in Wonderland and Manor of the Big Paw are remakes of levels from NepsterLems! Only stackers can survive this - not sure if this is an intended solution. Glide if you love lemmings - this one has two replays. Both are most likely backroutes. Let's Misbehave - likely a backroute as I am left with one basher. Smeagol's Dream - not sure if this is intended or not. 753 - looks like a major backroute as I am left with one stoner and one blocker. Temple of Hathor - this one leaves me with one basher. Serpentine Way - most likely a major backroute. All the 9's - this one should be an acceptable solution, since as you said this level has multiple solutions. Were those disarmers meant as decoys though, since this level doesn't have any traps? Stonerhenge - looks like a major backroute. I've also noticed that All Ice in Wonderland and Manor of the Big Paw are remakes of levels from NepsterLems! Well, the terrain layout is quite similar, but they (will once backroute-fixed) feature completely different solutions, namely namida's backroutes to the NepsterLems levels. Only stackers can survive this: Intended. Glide if you love lemming: Neither is intended, but I will probably do only mild modifications and keep the level as an easier open-ended level. 753: Ok, seems I have to throw the whole level away and start anew creating another level using the trick I intended to be used. Temple of Hathor: Intended. The basher is just a decoy. Serpentine Way: Yes, a backroute. Fortunately the non-solid sides in the upcoming NeoLemmix versions will take care of this backroute. All the Nines: Originally the level had 9 of all the new skills, so disarmers got included for sake of consistency. Stoners got removed, because they made the level trivial and I simply forgot about the disarmers. Expect to not see them again in new versions. After hibernating for six months, the tribes may advance a bit further on their journey: 12 new levels got added in V0.2 and most of the other levels got backroute-fixes. Have fun!